If I say "safety equipment", you probably think about helmets and yellow vests. 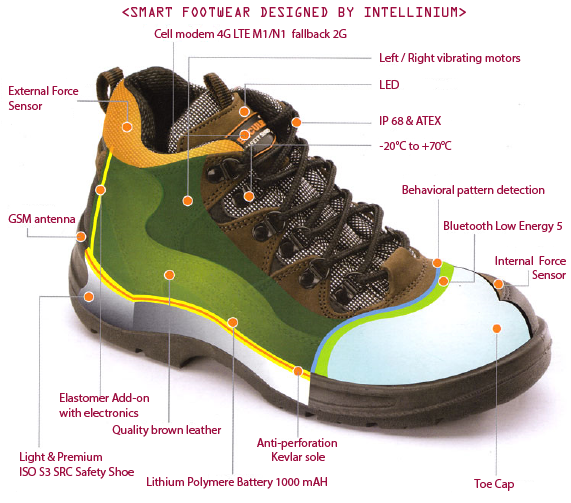 Intellinium, a startup from Provence in southern France, is revolutionizing this traditional image by developing a connected and intelligent safety shoe. 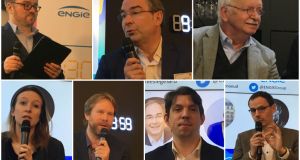 Already the winners of numerous awards, Intellinium has been invited to join ENGIE at Viva Technology and will be exhibiting from May 24th to May 25th. Mathieu Destrian, their CEO, introduced us to the company he created in 2009 and his vision for the future. Intellinium’s mission is to protect industrial assets in the broadest sense, meaning infrastructure, machinery, and people in particular. To do this we’ve developed smart, connected protective equipment, with a special focus on increasing safety for field agents and especially people who work alone. Worldwide, a worker dies every 15 seconds because of work-related causes. We measure ourselves by the number of lives we save and reducing the consequences of accidents in the workplace, which represent enormous social, societal and financial costs. Just like the way that a car’s on-board computer has virtualized and taken on the function of what was once separate pieces of equipment (e.g. GPS and music), we have made most of the equipment that workers used to use obsolete (such as PTI, DATI and even the mobile phone). This lets us "save" a lot of electronics, and therefore a significantly reduce e-waste, which has led us to us being identified as a CSR company. Fewer electronics, so fewer rare earths, and less energy consumed if we consider that millions of workers have 3 or 4 pieces of electronic equipment on them at any given time. We also bring better performance through technical design and innovative new components. The true value of our innovation lies in hardware, equipment and connections. We are currently working on the 3rd generation of our product, which we plan to start producing at the end of 2018, and which will include 3 telecom protocols: 2G, 4G LTE-M1 and 4G LTE-NB1 (also known as NB-IoT). To offer better penetration and coverage than current solutions, we use two telecom strategies: a cellular one and Bluetooth Low Energy (BLE in the most recent version 5), which allow for a wide variety of configurations and ensures better coverage. We also use an eSIM in our equipment, which immediately gives people real-time access to 100% of all the telecom operators in every European country (it's as if your phone had about ten SIM cards installed). Finally, we use optimized technical channels to capture even the weakest network signals, which allows us to transmit/receive in very difficult telecom conditions. Our equipment lets our users work in so-called “white areas” in which only certain operators provide service. In real white areas, which are rare, our equipment can "mesh" between them, meaning create point-to-point connections in an ad-hoc network. Even in the heart of the Sahara, you have the possibility (within a certain radius), to send a warning message to a coworker who can’t hear you or see you, the signal being sent through vibrators and support membranes located in the shoe. What will you be showing at your booth at Viva Technology? We will show a lighter version of what we presented at the Mobile World Congress in Barcelona: a tablet that we’ll use for visualization purposes and a connected object (in this case a shoe) that incorporates our technology, which we will use to demonstrate how a field agent can interact with their coworkers or manager. What do you expect to get from participating in Vivatech with ENGIE? First, to deepen our relationship with ENGIE. Our first meetings date back to 2014 when we worked on a smart city project in Casablanca, where we responded to a call for tenders with ENGIE Cofely and ENGIE Ineo. We then won a research project with CRIGEN and participated in the call for projects to prevent field workers from getting dehydrated in the Middle East. The central issue in that call for projects was very interesting because it resonates with the concerns of other industrial companies whose workers are subject to extreme cold weather or heat stroke. 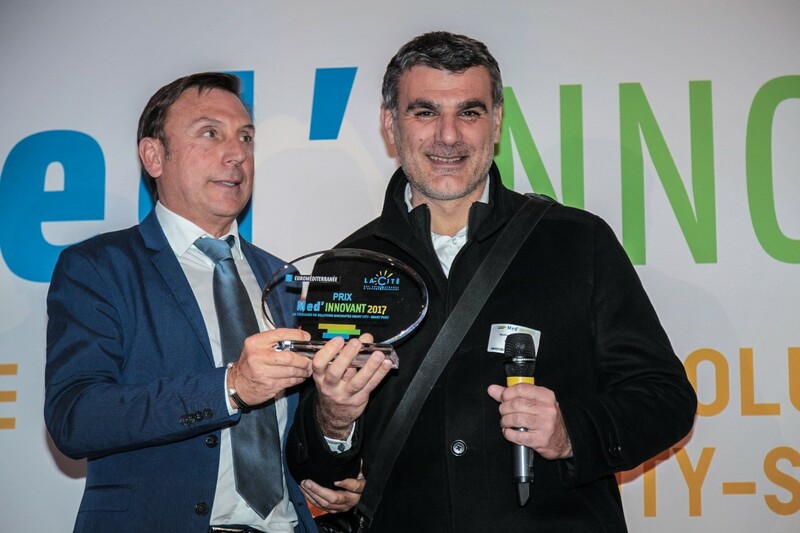 And we also won the Med Innovant Award in December 2017, which was presented by Michel Estève, ENGIE’s Regional Director for Southeast France. (through a demonstration project, for example). As a startup, we live off the expectations, constraints, and complexity of the needs of big companies. We are already in discussion with a number of CAC 40 companies but it is important for us to continue to spread the word about the new technologies that are our strength. We also hope to find technical partners. For example, we know that large accounts want gateways with big systems like SAP, Business Object or Sharepoint, which are not our specialty. Various integrators could collaborate with us on this part and we hope to meet them at Viva Technology. An example of how this approach works: in February we received an award in Munich, during which we established links with a Portuguese startup that detects and prevents heart ailments through t-shirts connected and embedding ECG sensors. They have become our technical partners, and we will integrate them into a heart sensor that detects fatigue, stress or risks of heart attack by monitoring heart rate. This type of meeting is of particular interest to us because in an increasingly technological world, expertise – especially about hardware – is precious. Why did you choose the shoe? Because everyone is obliged to wear shoes to work? That is one of the reasons. But there are others. · Because they can help limit the risks of exposure to electromagnetic waves, which has been recognized by the WHO (for causing cancer). There are also financial risks for an employer who requires an employee to wear equipment (transfer of liability), not to mention the risk of being refused by workplace safety committees or the employees themselves out of precaution. There are typically 3 zones to avoid exposing: the head, the chest, and the genital region. This ultimately leaves little space to install the equipment with all the computing and communication technologies. The technology involved here is Bluetooth Low Energy for peripheral equipment, which produced very low radiation levels that only transmit over a distance of 1 or 2 meters. The shoe houses the "hub" or "gateway" through which the collects the information from other protective equipment, packages it and ensures there is link with the outside. Our technology is on the outside of the shoe, which exposes less tissue to radiation and provides better performance (and is patented). · By the end of the year, we plan to recover the energy produced by walking through energy harvesting technologies, given that there are up to 4 possible sources of energy recovery on the feet. · If the hands or arms are blocked, occupied or fractured, how can you send a distress signal? As soon as both hands are being used, being able to communicate with the toe is a big advantage. An outer membrane also allows you to use your hands. How to communicate in a noisy environment that prevents you from talking? The two vibrators located in the shoe let you feel and understand messages transmitted from the outside regardless of the external environment. This device was the first one to be patented. · Finally, in terms of ergonomics, lots of excessive weight can be overlooked because it is on the feet. At the neck or waist level, it could eventually create musculoskeletal disorders (MSDs). We worked a lot with the unions and workplace safety committees because user comfort sits at the intersection of social, societal, regulatory, and salary constraints... If we cross-reference all these constraints, we know at about 99.9% that the foot is the best place to place the device. Does the user activates communication with his or her toe, or can the shoe itself relay information about potential danger? The shoe is stuffed with algorithms and knows how to make its own decisions, hence the "smart" side. The artificial intelligence present in the shoe is tasked with protecting and saving lives. The shoe becomes a permanent companion for the worker and can track the data about them locally without necessarily informing the employer, monitor their condition, wake them up if they faint or fall asleep and send a warning signal if they don’t respond. I would say that the future will be studious! Industry 4.0 is forcing us to reshuffle the cards and go back to the question: "what do I know" or rather "what do not I know"! 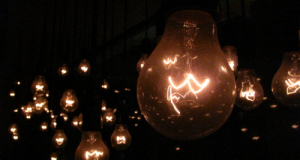 It’s requiring us to be studious, to constantly reinvent new, collaborative ways of working. We work on highly complex technical topics with silicon smelters, component manufacturers, telecom operators... and we try to provide solutions to a whole set of constraints where getting everyone onboard is sometimes difficult. The responses aren’t set in stone, and you have to look for them and start working together. It is in this sense that the future will be studious.